Jupiter's powerful gravity can help supercharge a meteor shower caused by trailing chunks of the famed Halley's comet, a new study suggests. 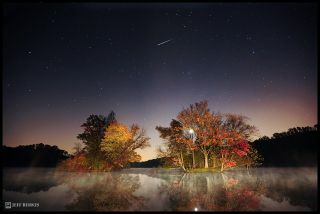 Every October, skywatchers are treated to a dazzling show when the Orionid meteors — leftover bits of Halley's comet, which zips by Earth every 76 years or so — burn up in our atmosphere. The Orionids are incredibly active from time to time, and this activity is generated by a complex orbital interplay among Jupiter, the comet and the meteoroids, according to the study. "This resonant behavior of meteoroids means that Halley's debris is not uniformly distributed along its orbital path," author Aswin Sekhar, of Armagh Observatory in Northern Ireland, said in a statement. "When the Earth encounters one of these clumps, it experiences a much more spectacular meteor shower than usual." Sekhar modeled the orbital evolution of Halley's comet over a long stretch of time, from more than 12,000 years in the past to 15,000 years into the future. He determined that from 1404 B.C. to 690 B.C., the comet was likely trapped in a 1:6 resonance with Jupiter (in which Halley completed one orbit for every six orbits of Jupiter around the sun). Later, from 240 B.C. to 1700 A.D., the comet was in a 2:13 orbital resonance with Jupiter. Debris streams deposited during these two periods are directly linked to heightened activity in the Orionid meteor showers in some years, according to the study. For example, Sekhar's work suggests that the unusual Orionid outburst observed in 1993 was due to 2:13 resonant meteoroids sloughed by Halley around 240 B.C. He predicts that the next similarly heightened display of meteors from this 2:13 resonance will be in 2070 A.D.
"The real beauty of this area of science lies in the convergence of cometary physics and orbital dynamics. The close correlation between historical records from ancient civilizations and the predictions using modern science make it even more elegant," Sekhar said. "There are enough unsolved problems pertaining to Halley and its meteor streams to keep us occupied till the next apparition of the comet in 2061." Sekhar presented the results Tuesday (March 27) at the National Astronomy Meeting in Manchester, the United Kingdom.